Notice to my regular readers: The Edhat web developer has expressed concern that my recent postings are overloading the server with too many photos. In the old days, I used to post just a couple of photos and then link to my own website. From now on, I plan to do a compromise: Link to my own website for most of the photos. But include up to about a dozen photos in the article. My latest Sierra Club outing had a wonderful group of lucky 13 hikers to explore the San Ysidro Trail. This was our first time after the fire and mudflow. I had tried to scout this in July and reached a dead end. Here are all of my photos arranged in several galleries! Hiker Mike Cutcliff sent me a GPS track of his scouting of the same trail which gave me a clue where I might have gone wrong in July. Still, it was a risk to take a group on a hike where I had already gotten lost. I am grateful to our group for having confidence. And it paid off! Here is the spot where the trail "obviously" goes straight. But, in fact, there is a tiny trail that sharply turns left in front of that rock near the center of the photo. There were some other tricky parts where the trail is a bit primitive. But the San Ysidro Trail always had some challenging parts. It is all quite hike-able with some care and attention. For me, the saddest part of the hike was seeing our beautiful pools completely gone. Here is how the biggest pool looked when I led this in April 2017. That entire area is just gone now. The San Ysidro Falls look pretty much as they did before. But the final access trail is completely gone. We started the hike near the washed out bridge to San Ysidro Ranch. The destruction is quite obvious there. Here are my photos near the trailhead and on the first section of the hike on the San Ysidro fire road. The main San Ysidro Ranch building is still OK, like a castle floating in the clouds! Some of the houses on the lower section of the trail appear to be mostly OK. But appearances can be deceiving. Reconstruction is underway on some of them. These reconstructed cottages on the San Ysidro Ranch are nearing completion. They have planted new trees to shield them since I last visited a few weeks earlier. There used to be an extensive wall of cactus. A few bits survived and even have fruits. But it will be a while before it all grows back. And some boulders seemed a bit precariously perched. Another big storm will probably bring them down. 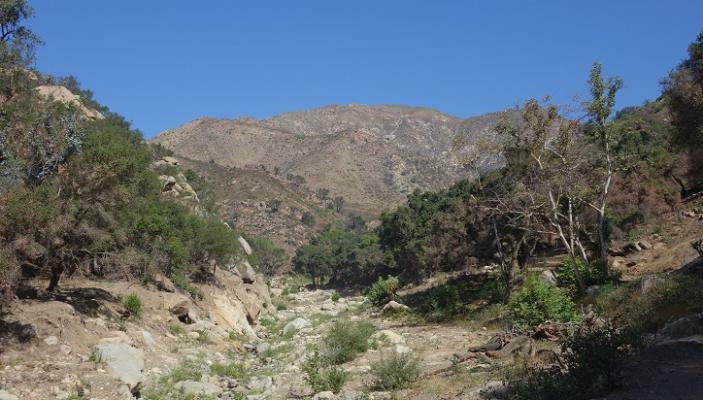 Here are my photos of the next section of the hike as we branched onto the actual San Ysidro Trail from the fire road. I was grateful for a sign warning of hazards. This is so much better than closing the trail! The City of Goleta closed many valuable trails in the Ellwood area due to much less serious hazards. Goleta City Council Member Kyle Richards was on this hike and he agreed that such warning signs may be a better option. Here are my photos at the San Ysidro Falls and nearby. Here you can see that the San Ysidro Falls look as they typically do in this season. More of a moist trickle than actual falls! What is new: The access trail on the right is totally gone. Access now is only up the stream bed below the Falls. We then backtracked a short distance to that nearby side creek. This had been quite small before the Montecito disasters. It is now quite wide and quite beautiful. Here are my photos in that creek area. I think these are my favorite photos from the hike! One highlight: These cute frogs. They appear to be Pseudacris cadaverina. Also known as the California Tree Frog or California Chorus Frog. Many had just metamorphosed. Here is my final set of photos: Our final descent. This image shows how the Fire Road is in good condition. But how barren the area is now. Here are my photos of the previous time I led this hike in April 2017. Quite a difference! I am happy my photos brought back happy memories of trail riding, FLICKA. It takes water and certain rock formations to create those pools. We lost a massive rock formation that is not coming back. I am glad that the frogs are able to find another happy habitat. This was a human-caused disaster. Some changes really are irreversible. Thanks, Robert, for the photos and especially the "before and after" ones. I grew up riding those trails and the difference now is sad. What a nice hike for the group. In a few years maybe new pools will "spring" up ----- if we ever get a substantial amount of rain, that is. Interesting, thanks! I particularly liked the one of the frog. But I am not sure I understand the "compromise" with what the edhat developer wants. Shouldn't his/her request be respected - and have most of the pictures linked to your own website? Or maybe have a time limit: after a couple of days, the pictures are only available on your own website? I can see that the pictures, 15 on this posting, could be an overload.